Working in a dry cleaners the apperance of my clothing has become very important to me. I can't stand the sight of wrinkled clothing! So when I was asked to review the Epica 1500 Watt Fabric Steamer, I was beyond happy to. Not only can you use this for your clothing but you could also use it for other items like your curtains, table cloths, or bedding. You can even use the steamer to get that pesky wall paper to peel off easier which I know everyone owning an older home dreads doing. I have learned a few tricks of the trade, working in a dry cleaner which has helped my experience with this type of product review. In a dry cleaner the number one element used is steam! The Epica steamer heats quicker than you'd expect, in only 45 seconds and your ready to go! You don't have to worry about carrying a bulky machine around especially if you are steaming something more than clothing. Gliding easily on casters, you can use the 4.3 ft. hose to work on all parts of your home with easy reach. The only thing I suggest when doing something larger like drapes and or curtains, is having two people. One to pull the curtain taunt and the other to steam. Actually when steaming any fabric you should pull the material taunt as it will help with more of a crisp look. 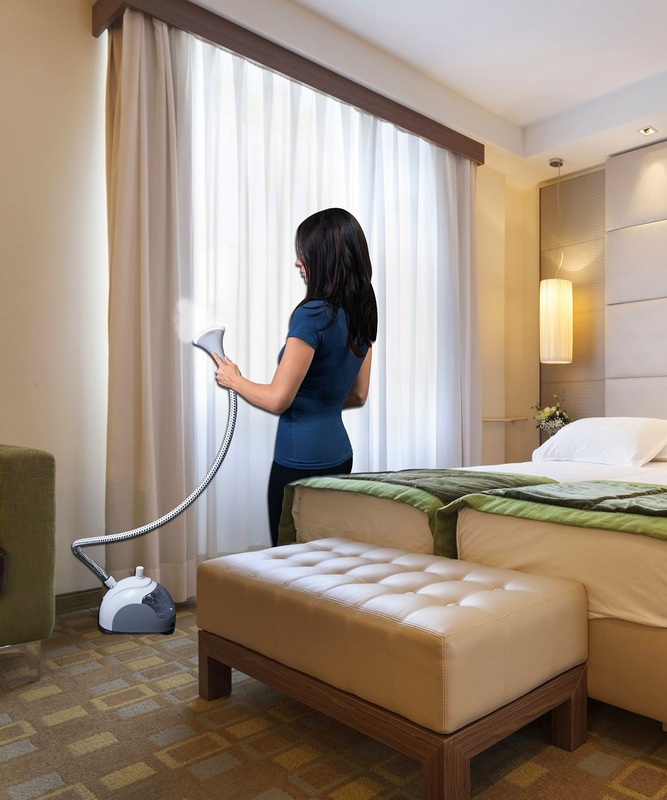 The Epica Steamer also comes with 51" adjustable, detachable pole for you to hang your garment on to steam. You don't have to worry about finding the perfect spot to steam your shirt. Whats better than that? This product is small enough to fit in your closet for storage. 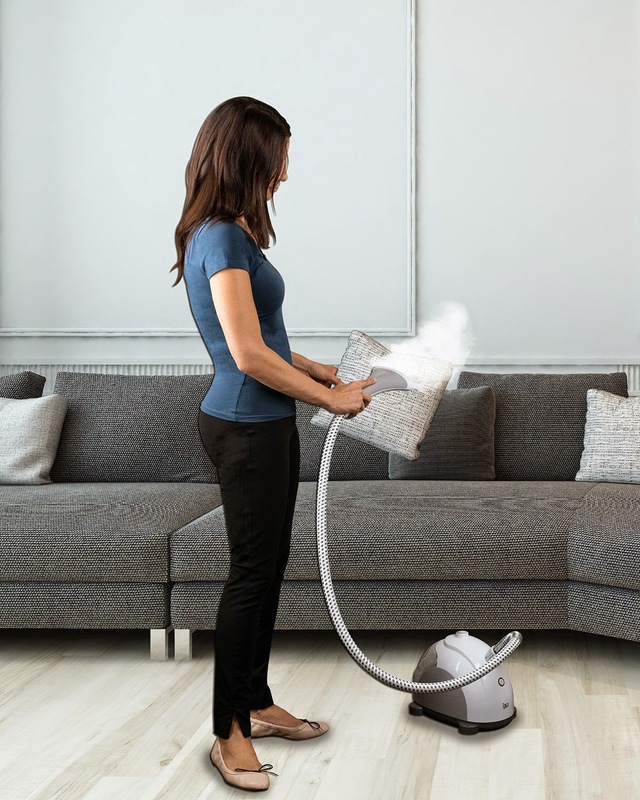 For those irritating garments that attract lint or for you men whose wives hair ends up all over, the Epica steamer also comes with a fabric brush that simultaneously removes wrinkles and hair. Not only does it come with a fabric brush but it also comes with a press pad which is like a hand held ironing board. The press pad is used for collars and hems. Being able to just do this from home instead of transporting my husbands work clothes back and forth is absolutely wonderful. I couldn't be more pleased as this product has made my life much easier! *A fair warning to any user...Be careful of hands and exposed skin when using this product as steam burns are beyond painful and dangerous. Recommendation: I thought this was a great tool for the home and found it to be very effective. My husbands clothes looked great and I've been using it on other fabrics around the home to clean this fall! As far as price goes I don't think this is priced any different than the average similar products and you can count on saving some good money avoiding the cleaners. I use my steamer for almost every small space in my home. It is very useful for cleaning and for health. Talking about clothes, I must say that it is very easy to use.